OVER 5,000 peasants from 23 districts of Maharashtra participated in the statewide Farmers’ Rights Convention organised by the All India Kisan Sabha (AIKS) Maharashtra state council at the prestigious Yashwantrao Chavan Auditorium, a stone’s throw away from the state assembly and the state secretariat, in the heart of south Mumbai, on November 12, 2018. The main auditorium overflowed beyond capacity, two other halls with screens in the same complex had to be engaged, and even then hundreds of peasants had to sit on the lawns below, satisfying themselves with only soundtrack arrangements. This convention achieved many objectives. It gave a call to mobilise in strength for the nationwide Kisan Mukti March to parliament organised by the AIKSCC on November 29-30 and in support of the all India strike by trade unions on January 8-9. It condemned the BJP-led government at the centre for its crass anti-farmer, anti-people, pro-corporate and neoliberal policies and its corrupt, communal and casteist conspiracies. It took the BJP-led state government to task for reneging on many of the written promises that it had given to the AIKS-led historic Kisan Long March from Nashik to Mumbai on March 6-12 this year. It highlighted the issue of the grim spectre of drought that is ravaging the state and the disastrous changes in drought criteria unilaterally imposed by the Modi regime. It called for a special session of parliament and the state assembly to discuss the agrarian crisis. Most important, it unanimously adopted a four-page, twelve-point resolution setting out the AIKS alternative on the burning agrarian issues in Maharashtra today. This AIKS resolution was given to all the peasants who attended. It was also given to top leaders of the Left and secular parties who were invited to place their opinions on it along with their views on the current agrarian crisis and what solutions they envisaged to deal with it. 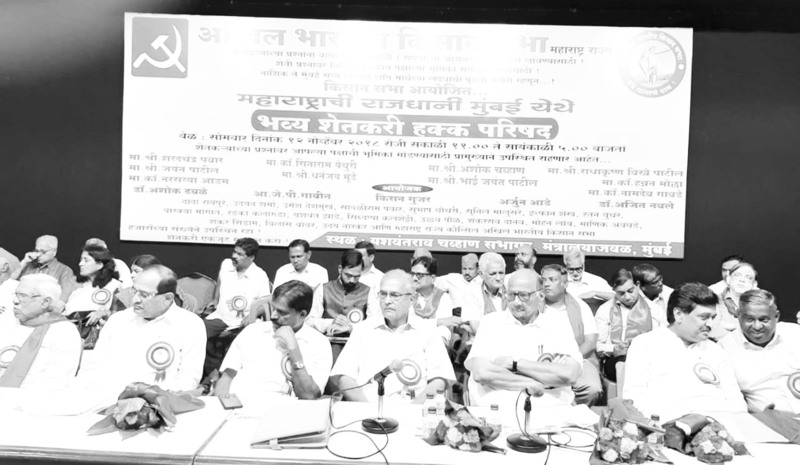 The decision to organise the Mumbai convention was taken at the AIKS statewide workshop held at Kolhapur in the sugar belt region of Western Maharashtra on October 22-23. The five hour-long convention began with the screening of a half an hour-long documentary film prepared by the state AIKS on the Kisan Long March, with sub-titles in Hindi and English. AIKS state working president Arjun Adey welcomed the gathering. The chief guest was AIKS general secretary and CPI(M) Polit Bureau member Hannan Mollah, ex-MP. The convention was presided over by AIKS president Ashok Dhawale. It was inaugurated by former state president J P Gavit, MLA. The resolution of the convention was placed by state general secretary Ajit Nawale and it was seconded by state president Kisan Gujar. Leaders of the Left and secular parties who placed their views were NCP president and former union minister for agriculture, food and defence Sharad Pawar, Congress state president and former chief minister Ashok Chavan, NCP state president and former state finance minister Jayant Patil, leader of the opposition in the state assembly Radhakrishna Vikhe Patil, PWP general secretary Jayant Patil, MLC, CPI(M) state secretary Narasayya Adam, ex-MLA, CPI leader Namdev Gavde and Bhoomi Adhikar Andolan leader Ulka Mahajan. AIKS state joint secretary Sunil Malusare proposed the vote of thanks. In his presidential speech at the outset, Ashok Dhawale said that the last 27 years of neoliberal policies have ruined agriculture and the peasantry. They have led to over three lakh peasant suicides due to indebtedness and tens of thousands of child deaths in the tribal areas due to hunger and malnutrition. The BJP-led Modi government has made things much worse. While denying loan waiver to farmers, the BJP regime showers three lakh crore rupees as loan waiver on its crony corporates and turns a blind eye to twelve lakh crore rupees of NPAs owed mostly by corporates to banks. It makes a mockery of its own assurance of MSP at one and a half times the cost of production. It attacks peasants through forced land acquisition and demonetisation and agricultural workers through slashing the outlay on MNREGA. To divert the attention of the people away from all its failures, the RSS-VHP-BJP now cynically raise their pet communal issue of the Ram Mandir at Ayodhya. Ashok Dhawale said that after the success of the AIKS struggles in Rajasthan, Maharashtra and elsewhere, and the massive worker-peasant nationwide mobilisation in the August 9 Jail Bharo and the September 5 Mazdoor Kisan Sangharsh Rally, the AIKSCC with over 200 farmers’ organisations, has organised a Kisan Mukti March to parliament on November 29-30 to demand a special session of parliament to pass the two bills of liberation from farm debt and assured fair prices, and to discuss the agrarian crisis. A platform called ‘Nation for Farmers’ is doing valuable work of supporting this Kisan Mukti March by mobilising various other sections of society. He called for making this march a great success and for concerted efforts to mobilise the peasantry to resoundingly defeat the BJP-RSS dispensation. Hannan Mollah said that the Modi regime began its tenure by bringing a draconian ordinance for forced land acquisition from farmers. A united struggle on the ground and united opposition in the Rajya Sabha forced the government to retreat. This struggle resulted in the formation of the Bhoomi Adhikar Andolan. The Mandsaur firing by the BJP government of Madhya Pradesh killed six farmers in a struggle for loan waiver and remunerative prices. After this, several farmer’s organisations came together to form the All India Kisan Sangharsh Coordination Committee. With constant struggles across the country against the Modi regime, the peasant movement in India is coming centre stage after many decades. The Kisan Mukti March to parliament is its next step which will help in the nationwide struggle to oust this ‘Narendra Modi, Kisan Virodhi’ government. Hannan Mollah lashed out at the BJP regime for its recourse to communalism, as seen in its renewed Ram Mandir campaign, and its corruption, as seen in the stinking Rafale deal. While stressing the need for a secular government, he also underlined the fact that it must adopt pro-people alternative policies. Finally, he congratulated the Maharashtra unit of the AIKS for its recent struggles and for this massive convention, and called for strengthening the movement and organisation of the AIKS in the days and years to come. J P Gavit, inaugurating the convention, criticised the BJP state government for betraying many of the promises given at the time of the Kisan Long March, particularly about the implementation of the Forest Rights Act. Had implementation begun on another AIKS demand of a scheme to divert the water of some west-flowing rivers to the chronically drought-hit areas of Marathwada, there would have been a ray of hope in these areas. He called for another massive struggle against this betrayal by the BJP state government. Ajit Nawale placed and Kisan Gujar seconded the resolution. The twelve points covered by it include: drought; land rights; loot of peasants; liberation from debt; remunerative prices; processing and marketing; irrigation and equitable distribution of water; farmer suicides; malnutrition, food security and health; good soil; Swaminathan Commission; and call to make a success of the Kisan Mukti March and the all India strike and the demand for special sessions of parliament and state assembly to discuss ways out of the agrarian crisis. Sharad Pawar in his outspoken speech attacked the Modi government as “a government of national calamity” which has no concern whatsoever for farmers and agricultural workers. The central and state governments of the BJP are completely insensitive to issues of drought and floods. To divert the people, the communal elements are now raising the issue of the Ram Mandir. The Rafale deal smacks of corruption, favouritism and wrongdoing at the highest levels. He called upon all secular forces to defeat the BJP regime at all costs. Similar sentiments were expressed by other leaders of Left and secular parties. The AIKS resolution was adopted unanimously by the convention, with leaders of all parties also supporting it. This AIKS convention received wide publicity in print, electronic and social media all over.